Cameron Appleton was at the helm of Team Aqua and seemed to cruise to victory in each of their four races. Leading the match race ranking coming into Cagliari, their form today cemented their place at the top of the leaderboard, two points ahead of Paul Cayard on Katusha and Russell Coutts steering Oracle Racing. Oracle Racing were also undefeated despite a sometimes eventful day. “The first race we lost one of our crew members overboard (Matt Coutts) at the windward mark and had to circle round and go back for him. Our second race was really close with No Way Back they were ahead of us but we managed to pass them. There was some good racing out there.” Explained Russell Coutts after racing. On a day where the professional skippers are allowed to steer, Igor Lah, at the helm of his own boat, Team CEEREF, put in a stand out performance taking three straight wins from Ironbound (USA) , Islas Canarias Puerto Calero (ESP)and Aleph (FRA) helmed by 2010 World Match Racing runner up, Mathieu Richard. 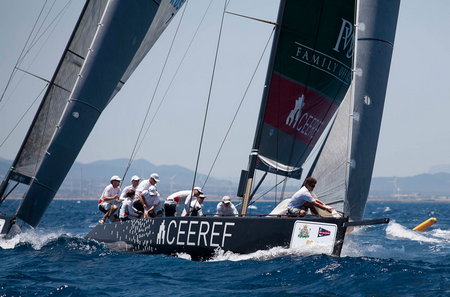 Team CEEREF sit fourth in the overall in the match racing standing on nine points, after three events events. On equal points is Artemis Racing who had good fortune on their side in their match against David Murphy’s Ironbound (USA). “We had an interesting race with Ironbound where we both went around the mark the wrong way. We managed to unwind ourselves, so even though they beat us on the water they didn’t sail the correct course, so didn’t get a result. Torbjorn (Tornqvist owner of Artemis) was the only one on the boat that noticed the mistake which was key to us doing well.” Explained a relieved Morgan Larson after racing. RUS 7 Racing team powered by anywayanyday.com picked up their only race win against fellow Russian’s Team Nika, whose owner Vladimir Prosikhin described their day as “Unlucky, but very enjoyable”. Racing continues for the RC44 Cagliari Cup from the 30th June – 3rd July.